I have previously featured the Italian version of Shepherds pie on my blog, but today, I am blogging about the good old traditional version of the dish. 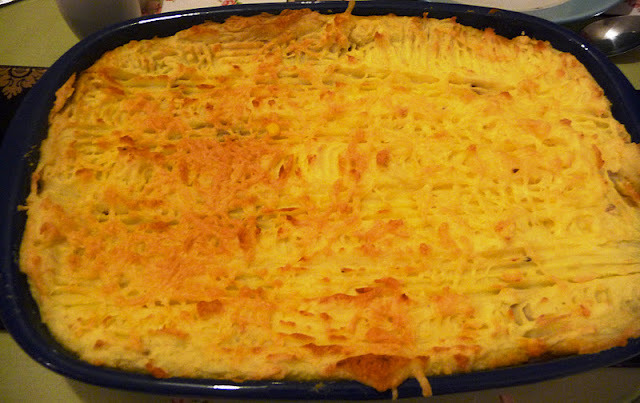 Shepherds pie is typically associated with mutton or lamb. The vegetarian version is generally known as Shepherdess pie. As well as using soya mince or tofu, you could also add baked beans or any kind of other beans, and lentils to bulk out the dish more. 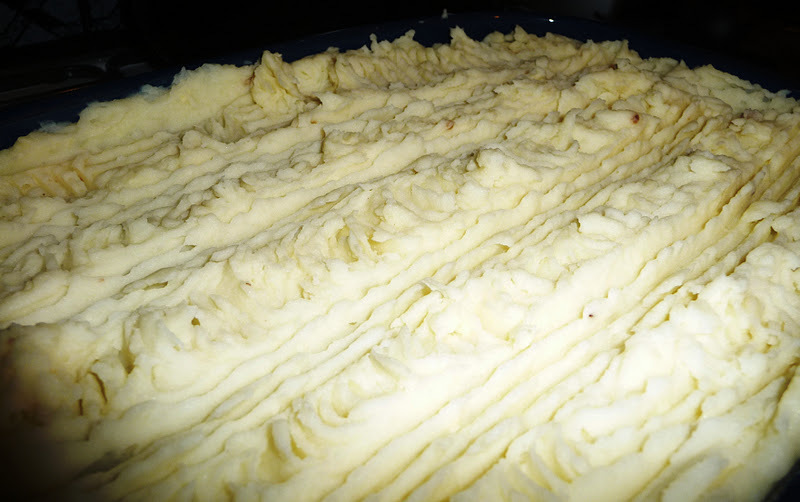 Shepherdess pie is a great family dish for a cold evening and can be eaten with the traditional potato and veg combo, or garlic bread and salad. It is an ideal dish to serve on bonfire night, along with jacket potatoes and tomato soup. It is also great for freezing uncooked and delicious as left overs, as it tastes even better the next day when the ingredients have fused together. Take a large saucepan and fry the onion in some oil over a medium heat for a couple of minutes, then add the mushrooms and carrots and fry for about 5 minutes. Next, add the mince and more oil as needed and fry for a further 5 minutes. Stir in the flour and cook for one minute, then gradually blend in the tomatoes, stock, tomato puree, worcestershire sauce and herbs, and season to taste. Cook, stirring until the mixture thickens and boils. Cover and simmer for 25 minutes. Once cooked, transfer the mince into an ovenproof dish and allow to cool a little. Meanwhile, peel and cook the potatoes in boiling water for 20 minutes until tender. 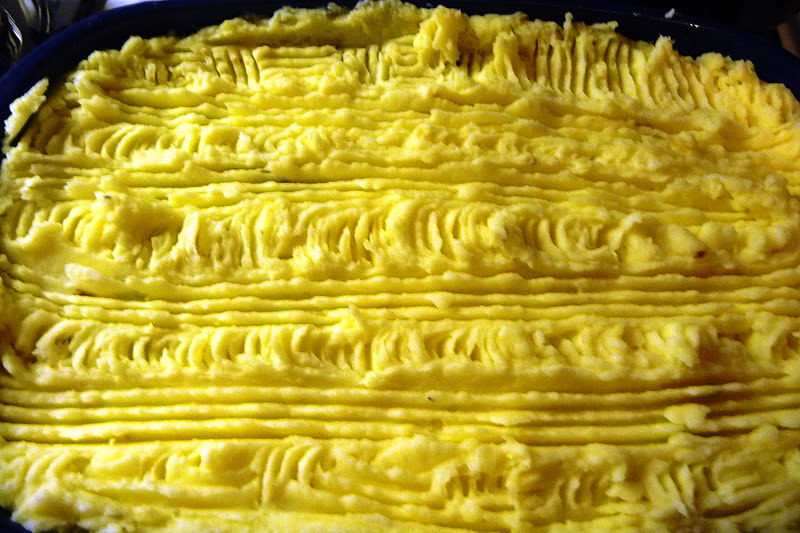 Drain well and mash with butter and milk. Cover the mince mixture with potato. You can also grate some cheese over the top if desired. Bake at 190 degrees, gas mark 5 for 30 to 45 minutes. Sounds lovely - have linked to my shepherdess pie, which uses a lot of lentils. It's been a while since I've tried it with soya mince, as it tends to make me bloat, though my dad used to make a delicious one with soya mince. Just a note that Worcestershire sauce contains fish and so is not suitable for full vegetarians. Would be fine for pescatarian meal though.